Thirteen-year-old Grace Phipps happened across a lost-looking 8-year-old a few days before Christmas in Victorian England. The young Minnie Maude is looking for Charlie, her donkey, who was missing, along with his cart, after Uncle Alf was killed. Despite her reservations Grace says she’ll help look for the donkey, but of course they end up investigating the murder of Uncle Alf. 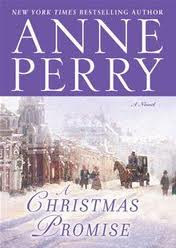 This short novel by Anne Perry has a stronger Christmas theme than the other one that I read, as it took place in the days leading up to Christmas and there were frequent mentions of preparations for the holiday. Another major contrast is tht A Christmas Journey took place among the upper classes, while A Christmas Promise was set in a poor neighborhood and the main characters were children. Just as quick to read, it was less cozy than A Christmas Journey because of the frequent mentions of cold and discomfort. It seems there was always a harsh biting wind, and the characters were constantly pulling their shawls more tightly about their bodies. Still, it was enjoyable in its own way, so I recommend it if you enjoy mysteries set in the Victorian period.